I felt like a creator lately, making all this cute Amigurumi dolls. The process of starting without knowing what would become, until seeing the end of each of them presenting itself was unbelievably thrill. Stuff dolls make such a wonderful gifts to the kids, and to those who are still young at heart. As for me, I enjoy more in the process of making rather than receiving them. My mini journey (about 2 months) of doing crocheted amigurumi dolls made me a proud ‘mother’ of 13 dolls. I was quite reluctant to make one in the first place as I always thought that making crocheted dolls were very tedious and I am no good in doing craft. But after making my very first one, I got hooked onto it and made another 12 more. I started by following the pattern as stated. Japanese patterns are very precise and easy to follow too. Their designs take each single details into consideration and you could imagine how precisely the doll would be like. Most of the doll design comes with 9 parts: the head, the body, the two front feets, the two back feets, the ears and the tail. Some have nose protuding and that add on to another new piece. Some come with dresses, sling bags, hats or other accessories like a ribbon or a flower. The eyes were either made by felt or plastic knobs. Some would need some cosmetic stitches for their eyelids, mouth or whiskers. You never know what it will look like until you have finished till the end. Each one is so unque even if I make another same pattern doll it could never turn up to be the same look. That is what make handmade so precious. So far, I have make one Doremon, one Doremi, two Hello Kitty, one Maneki Neko, one dragon, one Hippo, two cute bears, one dog, two pandas. The latest one that I made was a tiger doll. I wanted to do a tiger doll as next year will be the year of tiger. As I search through the internet, I came across the picture of a crocheted tiger doll. What I did was by looking at the picture, I found some similar patterns that I have used to make for the other dolls and improvise on them to create the pattern. It took me two days to try out and complete recording down the patterns and assembly the parts to the finished product. I’m kind of satisfied with the result. With this I am more confident of creating new pattern in the future. I guess I my fingers would still be busy for a while. May be no more dolls (unless there are incoming request) but something else like bags or wearable outfit. But again you never know. I probably came across some cute doll pictures and my fingers become itchy again. Haha! Most important of all is enjoy the process of making! P.S. : Anyone who is interested in getting the tiger crocheted pattern (pdf format) for free can send me a request via email: tinggreat@gmail.com. After notes: Due to increasing response for getting the tiger pattern, I decided not to give out freely. 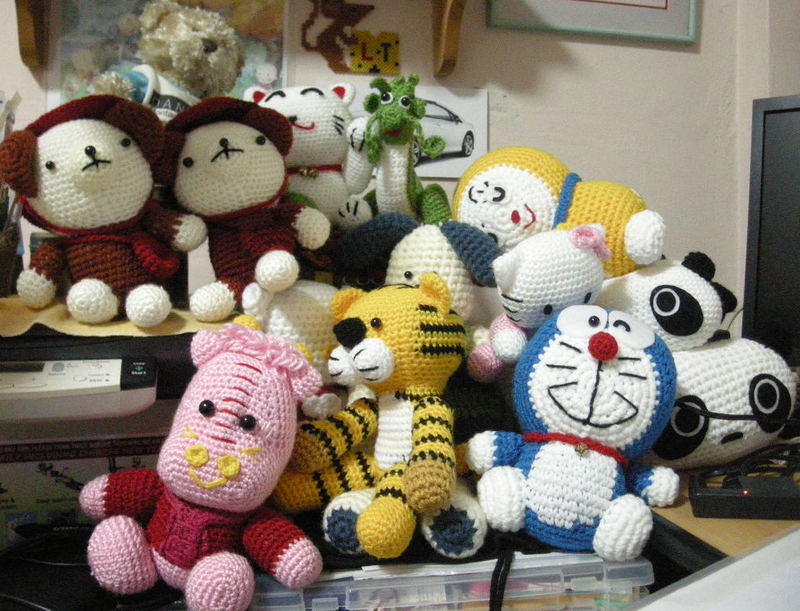 I will place the pattern for sales at Etsy http://www.etsy.com/listing/61869199/cute-crochet-tiger-pattern. Like My Crochet Amigurumi Dolls? Crocheting for me has changed from just hobby to an addicted actitivity. I like to do all sort of things that can be made from crocheting. Hope that I could be inspired to become a crochet designer one day.